The Lead Producer of World of Warcraft gives the skinny on the ultimate patch of Cataclysm. Like Illidan and Arthas before him, WoW players were pretty sure there was going to be a throwdown against the ancient Dragon Aspect, Neltharion - now known as Deathwing - in the final patch of Cataclysm. J. Allen Brack, lead producer of the MMO from Blizzard, said that with patch 4.3 not only will experienced raiders get a shot at downing the huge black dragon in the most epic raid fight ever, but players who aren't in a raiding guild will be able to find groups easier with a new Raid Finder tool. Brack also gave more information on the Void Storage and Transmogrification features and hinted at the news of an expansion that may drop at BlizzCon in October. Oh, and rogues will get some love in the form of a legendary dagger. Here is the full Q&A with the man behind the curtain of World of Warcraft on everything he has to say about the last patch of Cataclysm. Greg Tito: What can we expect from Patch 4.3? J. Allen Brack, Lead Producer of World of Warcraft: We've got a handful of features to talk about and we've got a handful of dungeons. Then something we've previously had in 4.3 is going to be the actual raid where players are able to fight Deathwing and ultimately defeat him. The raid and the dungeons are really tied together with one long story. 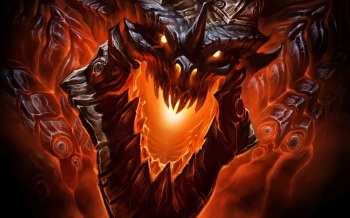 We're not really spoiling a whole lot as to how that is going to work but the lore of how players are actually able to gain enough power in order to defeat one of the most powerful dragon aspects is kind of told throughout the story of three dungeons and then the actual Deathwing raid. Tito: Cool. What are the three dungeons? Brack: The three dungeons will basically have different kind of pieces that allow players to [pause] we're not going to say too much about that. There will be three dungeons that players will be able to participate in that will be all new, something the players haven't done before. Then the story of those dungeons will lead right into the actual raid where players will actually confront and fight Deathwing. Tito: Is it going to be similar to how Icecrown Citadel worked where a bunch of five mans led up to the raid of Arthas? Brack: That's definitely the model although we wanted to tie the story of the raid and the story of the dungeons considerably tighter than we did for Icecrown. So with Icecrown we had what's it like to attack Arthas and how the players react to that in a five person dungeon but there wasn't necessarily a story that carried over from the dungeons to the raid in the same manner we're doing with Deathwing. But the model that we're following is very similar. Tito: Do you have anything else to say about that raid other than it's probably going to be pretty tough? Brack: We're trying to make it the most exciting most epic raid we've ever done. Players will actually fight Deathwing in multiple phases so there's a lot of different ways for players to be fighting Deathwing throughout that encounter. Tito: Is it going to be in the air or on the ground? Brack: We're actually doing multiple phases so there will be some ground phases and some air phases. Tito: Will you be flying other dragons? Brack: We're not going to say. To be determined. You'll have to see it when it goes live. Tito: Do the other dragon flights get involved? Brack: They're definitely a huge part of the lore and the story. The dragon flights kind of have to come together to help bring Deathwing down.